In Aug 2009, an American Academy of Implant Dentistry press release stated, "...times have changed and patients should forego prolonged dental heroics to save failing teeth and replace them with long-lasting dental implants". 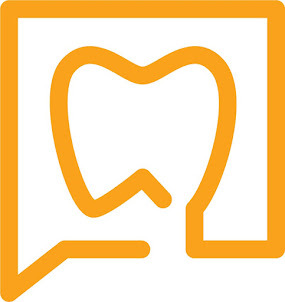 While it universally accepted that implants are a great way to replace missing teeth, a more controversial topic is when to replace a diseased tooth with an implant. In my opinion, those promoting dental implants have become increasingly more aggressive about replacing natural teeth. As a specialist, I am occasionally called upon to perform "heroic" procedures. This may be following some iatrogenic damage or by a patient who wishes to retain a natural tooth at any cost. While I would much rather treat a normal, straightforward endodontic case, the use of microscopes, ultrasonics and MTA have allowed us to preserve teeth that many would consider "hopeless". I am often amazed at the success that we have with some of these "heroic" cases. The following case was previously posted, but the patient returned for a 4 year recall last month. Unfortunately, the patient was returning for another root repair perforation following endodontic access on a different tooth. This case would be considered a "heroic" case by anyone's standard! In this particular case, this patient has been pleased with his decision to retain the tooth. This root canal was done just over four years ago. The patient presented with pain to percussion, and an 8 mm buccal probing was present. The RCT had been completed 2 years previously and recently became symptomatic. DX: Prior RCT w/ Symptomatic Apical Periodontitis. Treatment recommended: Non-surgical retreatment, perforation repair with possible need for endodontic surgery. Prognosis: guarded. As you can see, the MB canal is very calcified. Calcification of this kind would make this case a very high level of difficulty. The MB canal was missed and the furcation was found, instrumented & obturated. Proper case selection can help prevent this type of complication. However, if this does occur, one would expect to find bleeding and the tactile sensation of the pdl/cortical bone is very different from the canal. Length determination films, working films or final films should also identify the perforation. 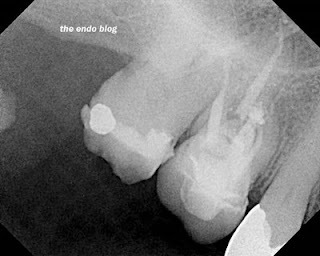 I would recommend immediate referral to an endodontist for treatment of an iatrogenic event such as this. Retreatment completed. MB canal located and treated. Furcal perforation repaired with MTA. 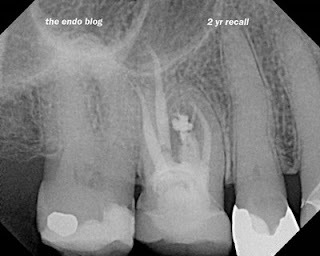 Patient placed on recall to watch the area and see if endodontic surgery will be required. Recall at 2 years & 3 months. Patient reports complete function and no symptoms. The 8mm periodontal probing has dissappeared. This tooth is considered "healing", and scheduled for a 1 year recall. 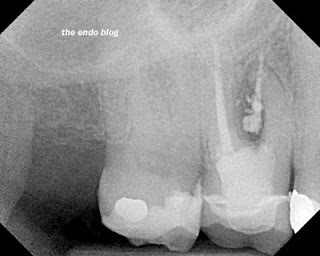 You can call it "herodontics", but that tooth is functional, apical bone looks good, periodontal pocket has disappeared. This will be a fun case to watch over time. NOTE: I have never said this is pretty. Actually, its pretty ugly. However, retaining the natural tooth has preserved the crestal bone, provided normal function, and cost much less in time and money than any replacement option available. You're the man! Looks like a fun case to have worked on. very nice result and excellent efforts to save the tooth convinsing the patient for such retreatment is most importent.